Carrying signs reading, “Stand with L.A. Teachers” and “Education is a human right,” educators, parents, and students rallied at City Hall before joining the union’s March for Public Education. The union argues that the Los Angeles Unified School District (LAUSD) is flush with cash that could be used to provide teachers with raises in one of the country’s most expensive cities, as well as hiring more support staff, nurses, and teachers to cut down on class size—which is at 45 students per class in some schools. 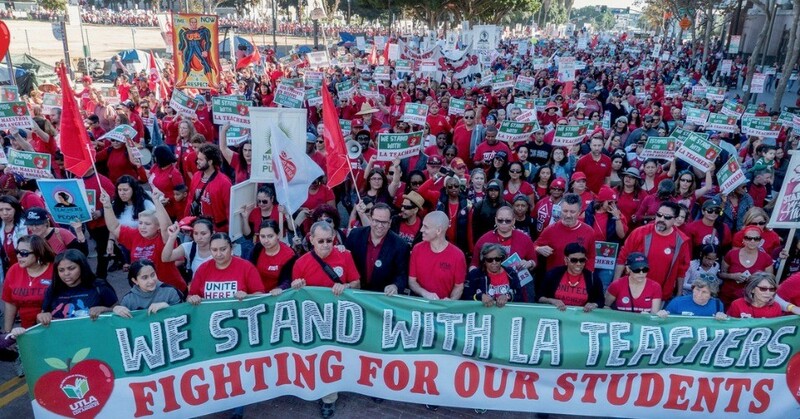 “Amidst the wealth of Los Angeles, we should not have class sizes of 45 students,” UTLA President Alex Caputo-Pearl told the crowd. “It’s wrong that the District is hoarding $2 billion dollars when they say there’s no money for the schools. It’s wrong when community schools are starving and charter schools are expanding,” American Federation of Teachers (AFT) President Randi Weingarten said. In some schools, demonstrators argued, the district’s refusal to staff the district properly has led to serious safety risks. LAUSD is the country’s second-largest school district, serving more than 600,000 students. Teachers are threatening to strike next month if the school district doesn’t meet their demands, providing more support for the city’s school children. The Los Angeles police estimated that between 10,000 and 15,000 marched on Saturday, while organizers counted about 50,000 participants. The union applauded school communities for turning out to support the city’s teachers.